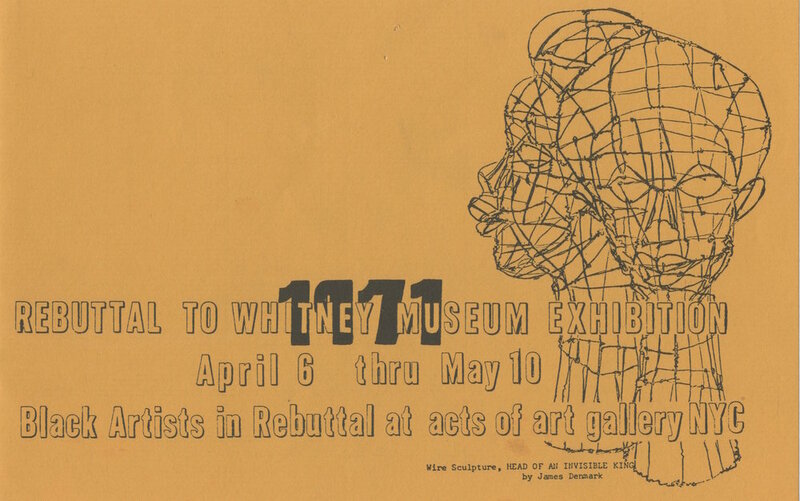 Invitation for Rebuttal to the Whitney Museum Exhibition: Black Artists in Rebuttal at Acts of Art Gallery, 1971. Courtesy RYAN LEE Gallery, New York and Adobe Krow Archives, Los Angeles. Acts of Art and Rebuttal revisits the 1971 exhibition Rebuttal to the Whitney Museum Exhibition: Black Artists in Rebuttal, which was organized by members of the Black Emergency Cultural Coalition at Acts of Art, a small, artist-run gallery in Greenwich Village. The original exhibition was mounted in response to the Whitney Museum’s refusal to appoint a Black curator for their survey Contemporary Black Artists in America. The exhibition at Hunter presents ten of the 47 artists from the original Rebuttal show, including Benny Andrews, Betty Blayton-Taylor, Vivian Browne, James Denmark, Cliff Joseph, Richard Mayhew, Dindga McCannon, Ademola Olugebefola, Haywood Bill Rivers, and Frank Wimberley. It is a selection intended to represent the stylistic diversity of the original exhibition, with works ranging from sardonic social satire and biting figurative expressionism to Yoruban-inspired symbolism and lyrical abstraction. Through these artists, the exhibition also traces a network of organizations and groups that supported the aspirations of Black artists and the community in the 1960s and early 1970s, among them: the Black Emergency Cultural Coalition; the Spiral group; the Studio Museum in Harlem; the Black nationalist artists’ group Weusi; and the Black women’s artist collective Where We At. Through its survey of the history of the short-lived Acts of Art gallery and the events leading up to the Rebuttal show, the exhibition and its accompanying catalogue explore the intersections between Black cultural communities and cultural politics in Greenwich Village, the Lower East Side, and Harlem in the late 1960s and early 1970s. Where possible, Acts of Art and Rebuttal presents works that were originally installed in the 1971 Rebuttal show, including works by Blayton-Taylor, Browne, Denmark, Joseph, and Rivers. In addition to the twenty paintings, prints, and collages, the exhibition includes a collection of posters, newspapers, mailers, and letters documenting Acts of Art, the Rebuttal show, and responses to it. Accompanying the ephemera is a 45-minute film by art historian Dr. Oakley N. Holmes, Jr. that documents the “Black Artists in America” panel held at the Art Students League in February 1971. The panelists include Andrews, Browne, Joseph, Mayhew, and other Black artists central to the moment, as well as Nigel Jackson, the founder of Acts of Art. To purchase Dr. Oakley N. Holmes, Jr.’s Historical and Archival DVDs on Celebrated African-American Art, please use the order form attached here. “Conversations on Acts of Art and Rebuttal,” with artists James Denmark, Richard Mayhew, Dindga McCannon, Ademola Olugebefola, and Frank Wimberley, and art historian and filmmaker Dr. Oakley N. Holmes, Jr., in discussion with professors LeRonn Brooks, Lisa Corinne Davis, and Lisa Farrington. For further information on programming, please visit huntercollegeartgalleries.org. Acts of Art and Rebuttal in 1971 is made possible by the generous support of the David Bershad Family Foundation, the Susan V. Bershad Charitable Fund, Inc., Carol and Arthur Goldberg, Agnes Gund and Joan Lazarus in support of the Curatorial Certificate Program, and the Leubsdorf Fund.